Bob and Joss return for another hilarious adventure as they hike in circles through the woods (without a clue about where they are going)! From dynamic author Peter McCleery and esteemed children’s book illustrator Vin Vogel comes a fun, rib-tickling escapade where this unmatched pair of best buds climb trees, get itchy bites from bugs, and hike a never-ending trail to find their way back to their camp site. 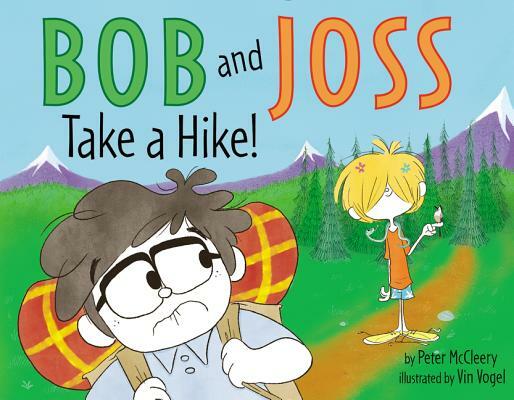 Full of bold illustrations and clever one-liners, Bob and Joss Take a Hike! is sure to have young readers laughing along. “I won’t forget the map,” said Joss. For more Bob and Joss fun, check out Bob and Joss Get Lost! Peter McCleery lives and works and occasionally gets lost in Portland, Oregon. Among his favorite things are kids who laugh. If you find him, please return him safely home to his wife, two kids, and cat. You can visit him online at www.petermccleery.com. Vin Vogel is an award-winning Brazilian author-illustrator. He has illustrated more than fifty books for children and young adults, including his own The Thing About Yetis and Bedtime for Yeti. After having lived in New York City, he is back to his tropical hometown, Rio, where he lives with his two cats and a mini Malibu surfboard. You can visit him at www.vinvogel.com.